Looking for a comfortable yet stylish office chair? Look no further! 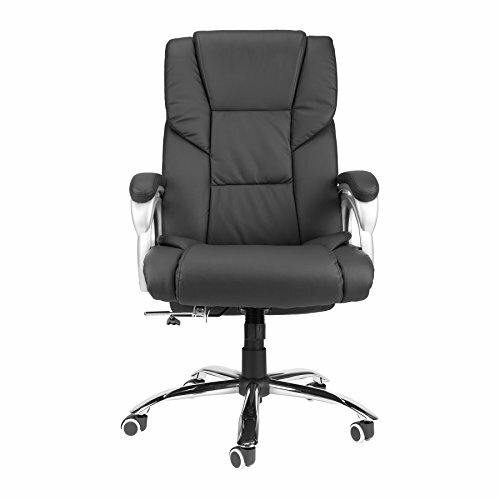 Check out our deluxe executive office chair. It tilts, it swivels, and it is super comfortable to sit on, even for long periods of time. With a high backrest, you can even take a quick nap on this wonderful chair! What are you waiting for? Chair height: 44.9" to 47.6"
Double-layered Seat - Double-layered swivel and rocking chair (15º, when it is not locked) filled with PP and foam as top and bottom fillings, ensuring anti-deformation performance with maximum comfort. Ergonomical Design - Ergonomically designed high back rest provides ample support, great for taking nap.